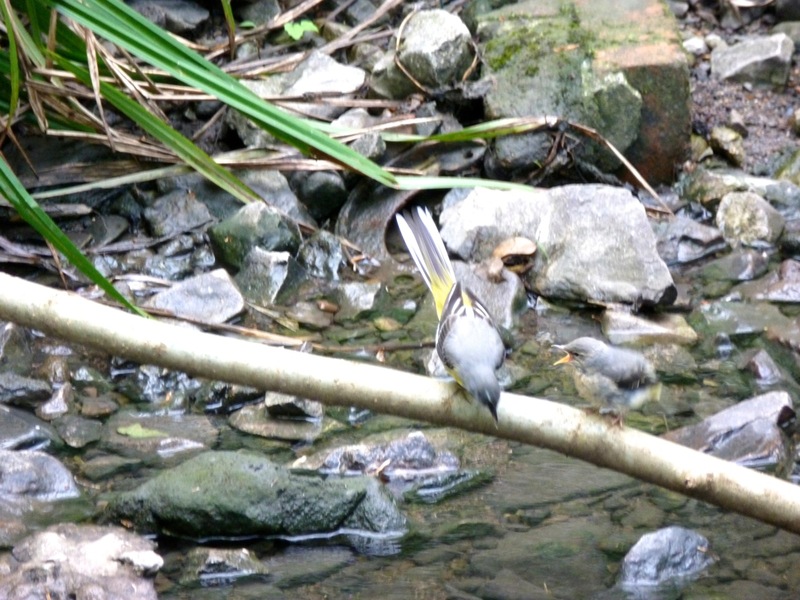 Down in the woods where the garlic and the bluebells line the banks of the Trym the unnamed stream runs under a little bridge; there you can find a couple of fledgling grey wagtails – Motacillia cinerea – who are working extremely hard at the business of being baby birds. This seems to consist of a lot of sitting and squeaking and keeping a very close eye on your parents and flying into the scrub when there is too much noise and activity on the banks. Our little woodland is so well used with all the enthusiastic dogs running around that I am quite honestly surprised and overjoyed to see these babies. The wagtails offer a flash of colour from their bright yellow underparts as they trek up and down the stream all winter, looking for insects and other food and are surprisingly unbothered by the dogs and the visitors. I think I wrote once before that maybe these particular birds have learnt to associate mammals with their food source, as flies congregate round fresh faeces, and that they see the dogs as part of their food chain, who knows? We have had them visit the garden once or twice and always for that reason. It isn’t an easy bird to photograph, unlke a nice sedate swan or duck, the adult very rarely stands still and even when it is stopped for a moment on a stone or on the bank, its distinctive long tail is bobbing up and down. The grey wagtail has grey upperparts and a yellow vent, a broken eye ring and a white supercillium. The one most of us see in the cities in England is the pied wagtail, which turns up quite often on city streets, in car parks, and shopping centres with its distinctive black and white plumage. I have seen grey wagtails like these on flat roofs behind office buildings, but there always has to be a big puddle or something like that there. They are birds of the water’s edge feeding on flies, mayflies, beetles, crustacea and molluscs according to Wikipedia – I wonder if they eat the leeches that live under the stones. This was my best effort, what is politely called a ‘record shot’ because it allows you to identify the bird with reasonable certainty but it certainly won’t win any prizes! My camera is simply not fast enough to catch them on the move. I have just added it as a thumbnail so you can click on it to see it bigger if you want to see it. I asked Brian to have a go at taking some photos yesterday and these are the results. He used a Canon EOS IV. way too heavy for me. The birds are surprisingly well camouflaged against the stones and the lichens and the rippling water as it runs over the rocks. It was easiest to photograph the babies as they stood quite still, the parent’s head is almost impossible to get in focus, most of the time, her beak was stuffed with flies and food and that also creates a blurred look to her head. At one point three primary school groups appeared to do pond dipping as well. It is all go down there! I forgot this one, which shows the male’s black bib more clearly, I think both parents feed the babies. And so it goes, parental responsbilities eh? This post is for Rose who tweets and photographs birds but I hope you like Brian’s photos too! There is a nice bit of film here of a pair that has nested in a lock from BBC Nature. This entry was posted in Birds, Dog Walks, Out and About, Wildlife and tagged birds, feeding, fledgling, grey wagtail, walks on 17/05/2013 by Joanna. Joanna, Fantastic photos , compliments to the photographer what lovely story. Baby birds just like children! I will pass your compliments to Brian, thanks Fran! Thanks for reading Mel! It is fun to see the different birds isn’t it? Very occasionally an American robin turns up blown by some wind across the Atlantic and all the bird watchers rush out to see. Lovely Joanna. I can just imagine them busying themselves down by the water. My kids favourite thing to watch at the moment is “Walk on the Wild Side”- from the bbc. Has them in hysterics, yep, (even the little one :-) Reminds me of that. Love the post and pix!! Brian is such a good photographer! Love the photos and the captions. We have lots of the little black and white willy wagtails here – they are very friendly and follow us round on the golf course. Our buggy wheels disturb little insects for them. They are incredibly brave little things and will see off much bigger birds. Birds that are brave and adaptable with regard to what they eat and where they sleep seem to get on living closer to us than some very shy birds. I love the idea of being followed by a hopeful train of wagtails round and about. Swallows fly over cars on country roads for similar reasons as the cars move the air around and ‘throw’ the insects up. Glad you enjoyed the post Ann ! What gorgeous little birds, and great photos too. We discovered some baby birds in a nest, but when I went back for another look they were gone. I am hoping they were big enough to fly away, but I also saw a very large snake sunning itself and looking particularly please with itself. I hope your babies fledged and flew away Debra – you must get wonderful birds Bagna di Lucca – though the perils of snakes and predatory bigger birds waiting to grab them are large and casualties can be high. I went back yesterday and the baby wagtails are growing fast. Hoping they survive! Seems a bit early to have baby wagtails, it looks quite grown up. The American robin is I think a thrush. Defo not a real robin. Hi B, please check out some bird sites on the net and you will see that these are babies (short tails, plumage, behaviour) and not adults and it is the right time of year as well. They grow very fast, hence all the feeding. As for the American robin, yes it is a thrush but it is named for the Old World European bird on account of its breast colour. They’re beautiful photos and I love your story too. I don’t have the necessary skill for wildlife photography and am very much in awe of those who do – Brian’s photographs are great! Thank you Charlie! We have two dogs that need walks, so it becomes part of the day to go out somewhere and try and keep fairly close to home during the week otherwise it is long car drives. This is a tiny piece of woodland given to the City by the landowner last century for the enjoyment of the people who live here. Great photos and very entertaining read.